The African School on Internet Governance (AfriSIG) was announced this week as the winner of a 2017 World Summit on the Information Society (WSIS) Prize, awarded by the International Telecommunication Union (ITU), in a ceremony at the Geneva International Conference Centre during the annual WSIS Forum 2017. AfriSIG is a joint initiative of the Association for Progressive Communications (APC) and the NEPAD Agency. The School aims to give Africans from diverse sectors and stakeholder groups the opportunity to gain knowledge, experience and confidence to participate effectively in internet governance processes and debates nationally, regionally and globally. It contributes to increasing the diversity, extent, quality and influence of African participation in internet governance by creating a space that promotes multistakeholder learning and dialogue. AfriSIG brings together people of all ages, and with a wide range of experience. Participants range from professionals at the pinnacle of their careers, such as heads of regional regulatory agencies, to young entrepreneurs and civil society activists. 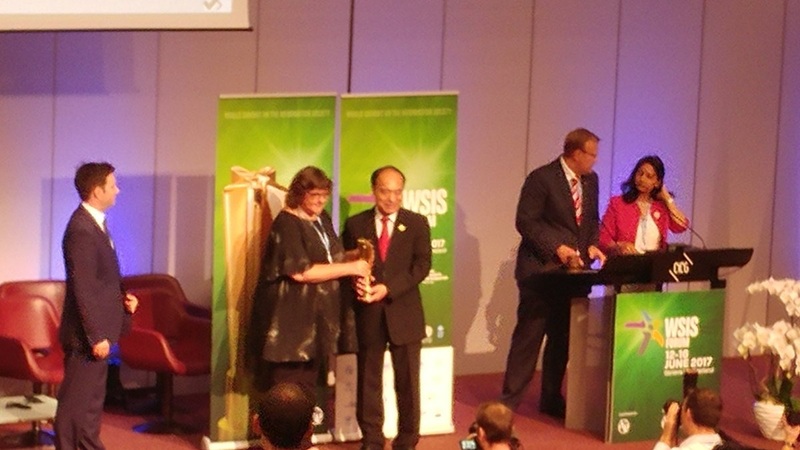 Anriette Esterhuysen, director of Global Policy and Strategy at APC, received the award on behalf of APC and NEPAD Agency from ITU Secretary-General Houlin Zhao during the awards ceremony on 12 June. Towela Nyirenda-Jere, NEPAD Agency’s principal programme officer in the Regional Integration, Infrastructure and Trade Programme, said the WSIS Prize awarded to the African School on Internet Governance shows the importance attached to good governance in Africa’s digital era. “Continental and regional approaches towards internet governance in Africa, such as those embraced by AfriSIG, enable policy makers to draw from the expertise of multistakeholders across the continent, in ensuring good governance, even as internet penetration levels on the continent keep rising,” she added. This year, 345 information and communications technology (ICT) success stories were nominated and over a million votes were cast in the online voting process that resulted in the selection of 90 exceptional ICT initiatives. The four top-ranked projects in each category (AfriSIG captured first place in Category 18: International and regional cooperation) were recognised during the special ceremony dedicated to their success and received special certificates of achievement. “This award not only represents international recognition of our efforts to strengthen the engagement of African stakeholders in national, regional and global internet policy processes and debates, but serves to renew our commitment to that goal as well,” said Valeria Betancourt, manager of APC’s Communications and Information Policy Programme. APC and the NEPAD Agency thank the ITU for this recognition and also extend their thanks to the people who voted for the initiative and who have made AfriSIG possible since 2013. The full list of the 2017 WSIS Prize winners in all categories is available here.